Background Although recurrent hamstring injury is a frequent problem with a significant impact on athletes, data on factors determining the risk for a recurrent hamstring injury are scarce. Objective To systematically review the literature and provide an overview of risk factors for re-injury of acute hamstring muscle injuries. Study design Prospective studies on risk factors for re-injury following acute hamstring injuries were systematically reviewed. Medical databases and reference lists of the included articles were searched. Two reviewers independently selected potential studies and assessed methodological quality; one reviewer extracted the data. A best-evidence synthesis of all studied risk factors was performed. Results Of the 131 articles identified, five prospective follow-up studies fulfilled our inclusion criteria. These studies reported a recurrence incidence of 13.9–63.3% in the same playing season up to 2 years after initial injury. Limited evidence for three risk factors and one protective factor for recurrent hamstring injury was found; patients with a recurrent hamstring injury had an initial injury with a larger volume size as measured on MRI (47.03 vs 12.42 cm3), more often had a Grade 1 initial trauma (Grade 0: 0–30.4%; Grade 1: 60.9–100%; Grade 2: 8.7%) and more often had a previous ipsilateral anterior cruciate ligament (ACL) reconstruction (66.6% vs 17.1%) independent of graft selection. Athletes in a rehabilitation programme with agility/stabilisation exercises rather than strength/stretching exercises had a lower risk for re-injury (7.7% vs 70%). 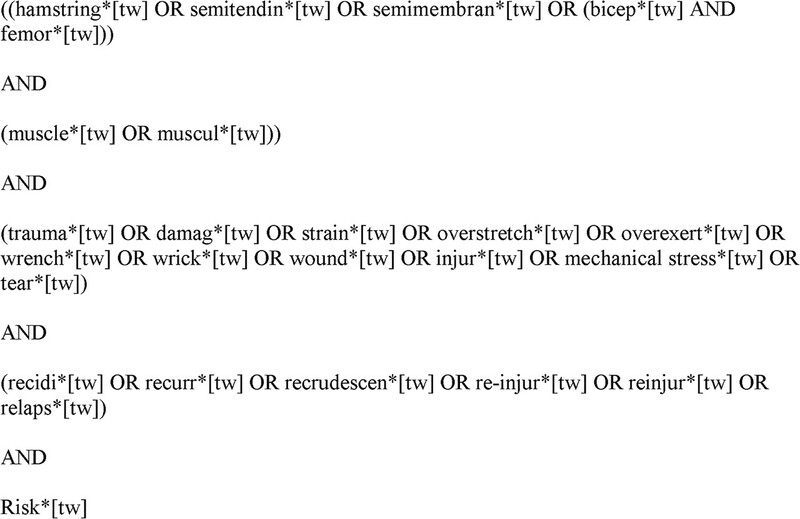 No significant relationship with re-injury was found for 11 related determinants. There was conflicting evidence that a larger cross-sectional area is a risk factor for recurrent hamstring injury. Conclusions There is limited evidence that athletes with a larger volume size of initial trauma, a Grade 1 hamstring injury and a previous ipsilateral ACL reconstruction are at increased risk for recurrent hamstring injury. Athletes seem to be at lower risk for re-injury when following agility/stabilisation exercises. To address these items, this study provides a systematic review of the currently reported risk factors for recurrent hamstring injury. A systematic search was performed to identify relevant studies in PubMed, EMBASE, CINAHL and Web of Science since their inception up to April 2011. Figure 1 presents an overview of the complete search strategy. (2) Prospective studies with a minimal follow-up period of 2 weeks after return to sport. (3) Full text of the article was available. (4) The article was written in English, German or Dutch; if a subset of the total patients included in a study met our inclusion criteria, the study was included only if the outcomes of the subset were assessed and reported separately. Information concerning the severity of initial injury should be reported in the studies because this could probably influence the rehabilitation, timing of return to sport and consequently be a potential risk factor for recurrent injury. Two reviewers (HMV and PKB)independently applied the inclusion criteria to select potential studies. A consensus method was used to solve any disagreements concerning the inclusion of the studies. A third reviewer (MR) was consulted when disagreement persisted. Disagreements were solved in a single consensus meeting, without the help of the third reviewer. Two reviewers (HMV and MR) independently assessed the methodological quality on the external and internal validity of each included study, using questions of existing quality assessment tools.13 14 Table 2 lists the five quality criteria; each item was scored as a ‘yes, ‘no’ or ‘unable to determine’. Disagreements were solved in a single consensus meeting. Studies were classified as high quality when minimally three criteria scored a ‘yes’ and when the question ‘Was there adequate adjustment for confounding in the analysis from which the main findings were drawn?’ also scored ‘yes’. Adjustment had to be made for ‘age’ and ‘gender’. One author (HMV) extracted the data. Information was collected on the study population, diagnostic test used, determinants measured and the definition of re-injury. Strong evidence: provided by two or more studies with high quality (=quality assessment ≥3 and adjustment for confounders) and by generally consistent findings in all studies (>75% of the studies reported consistent findings). Moderate evidence: provided by one high-quality study and two or more low-quality studies and by generally consistent findings in all studies (>75%). Limited evidence: provided by low-quality studies or in one high-quality study and by generally consistent findings (>75%). Conflicting evidence: provided by conflicting findings (<75% of the studies reported consistent findings). No evidence: provided when no studies could be found. The initial search yielded 131 records (29 from PubMed, 41 from EMBASE, 33 from Web of Science and 28 from CINAHL). After duplicates were removed, 75 remained. Finally, five studies met our inclusion criteria, and were included in this review9 10 17,–,19 (figure 2). The included studies reported a recurrence incidence of 13.9–63.3% in the same playing season up to 2 years after initial injury. Athletes from different sports were included (most of them participating in Australian Rules football) and were mainly men (73.8%). The study by Malliaropoulos et al,10 with 165 subjects, had the largest study population. The remaining four studies included 24–41 subjects. None of the studies included athletes with a complete rupture of the hamstring (Grade 3) (table 3). The two reviewers had four disagreements that were solved in a single consensus meeting. The methodological quality of the included studies ranged from 1 to 4 points (table 4). Because none of the five studies corrected the relationship for known confounders (such as age and gender), none of the evaluated determinants could be judged as strong or moderate evidence in the best-evidence synthesis. Table 5 presents an overview of the levels of evidence. Koulouris et al reported that athletes with a previous ipsilateral anterior cruciate ligament (ACL) reconstruction had an increased risk of a hamstring re-injury compared with athletes without a previous ACL reconstruction (66.6% vs 17.1%, respectively); the risk for a re-injury was independent of graft selection (hamstring or bone patellar-tendon bone).17 Verrall et al18 reported that athletes with a re-injury had a larger volume size of the initial trauma as measured on MRI compared with athletes without a re-injury (47.03 vs 12.42 cm3, respectively). This systematic review aimed to provide an overview of the current evidence for known risk factors of recurrent hamstring injuries. Our search strategy yielded five relevant studies in which a recurrence incidence of 13.9–63.3% was reported. None of these studies corrected the relationship for known confounders and, consequently, none of the determinants could be judged as having strong or moderate evidence. Limited evidence was found for a larger volume size of the initial injury as measured on MRI, Grade 1 injuries and a previous ipsilateral ACL reconstruction to be risk factors for recurrent injury. Also, limited evidence was found that athletes who followed a rehabilitation programme focusing on ‘agility and stability’ had a decreased risk of a recurrent hamstring injury compared with a ‘stretching and strength’ protocol. For all other determinants, no evidence was found for a relationship with a recurrent hamstring injury. It is noteworthy that the reported incidence of recurrent hamstring injuries ranged from 13.9% to 63.3%.9 10 17,–,19 A possible explanation for this wide range might be the follow-up period used; that is, with a longer follow-up, more re-injuries can be reported. However, the highest and lowest recurrences were reported in studies with a similar follow-up period of 2 years,10 18 indicating that the follow-up had no specific relationship with the differences in re-injury rates. The characteristics of the included studies were similar regarding age, gender, number of subjects and level of sports. This indicates that differences in the study population are not solely responsible for the difference in re-injury incidence. The severity of the initial trauma of the study populations also differed; two studies included athletes with Grade 0 injuries and both reported the lowest recurrence rate of all studies.9 10 Thus, it seems that re-injury rates decrease when patients with less severe initial trauma are included. The time until return to sports may also influence re-injury rates, that is, without a complete recovery, there may be a higher risk to suffer a re-injury. All the included studies used different rehabilitation programmes and different criteria to determine whether athletes were completely recovered. Therefore, it seems that the differences in the rehabilitation programme and the return to sport criteria might explain the differences in re-injury rates. In conclusion, the differences in the severity of the initial trauma, the rehabilitation programme and the criteria used for return to sports could be responsible for the differences in the reported re-injury rates. One study reported that a larger volume area is related to re-injury.18 Nevertheless, another study reported that Grade 1, compared with Grade 2 initial injuries, has a higher risk for re-injury.10 Thus, there are some contradictions in these findings. Malliaropoulos et al10 suggest that athletes with more severe injuries experience a longer rehabilitation time and will, therefore, have less re-injuries.10 Thus, a possible explanation for this apparent contradiction is the difference in the time to return to sport. Malliaropoulos et al10 reported a mean time of return to sport of 29.5 days for Grade 2 injuries, and Verrall et al18 reported a mean time of return to sport of 29.1 days but did not differentiate between grades of injury. Despite the similar mean time to return to sport in both these studies, the recurrence incidence was higher in the study of Verrall et al.18 Unfortunately, these authors did not report the rehabilitation periods for different grades of initial injury. Also, both studies used different study populations. Malliaropoulos et al included 165 track and field athletes with an age range of 18–24 years and 57.7% male athletes. The rehabilitation protocol focused on normalisation of gait, regaining pain-free range of motion, return to running activities, sport-specific training and agility drills; return to full athletic activities was allowed when three clinical tests were successfully passed.10 Verrall et al included 30 male Australian Rules football athletes with a mean age of 23.6±3.2 years; the rehabilitation protocol focused on pain-free walking, passive hamstring stretches to point of pain, speed running without rapid acceleration and active hamstring stretches when pain-free.18 Return to full athletic activities was allowed when 1 full week of training was achieved.18 Because both studies used the same length of follow-up, the period of rehabilitation could not explain the differences between these two studies. The differences might be explained by the characteristics of the studies, especially the study population, rehabilitation protocol and return to sport criteria used. There is no consensus on the definition of a recurrent hamstring injury, and several studies used different definitions. We followed the definition as described in a previous review, which defined a recurrent hamstring injury as an injury of the same type and location.20 A specific time frame in which the re-injury should take place was not defined. In our opinion, the best way to document a recurrent injury should be a confirmed trauma on the same location as the initial injury on MRI or on sonography. The actual presence of an initial Grade 0 hamstring injury exists even though it remains speculative, because no abnormality is detected on MRI or on sonography. Therefore, we consider a recurrent hamstring injury to be a confirmed injury on the same location as the initial injury after full return to sport activity. Moreover, we suggest that future studies could analyse their findings with Grade 0 injuries and without Grade 0 hamstring injuries. A possible limitation of MRI assessment is that all muscle injuries have associated oedema and haemorrhage, which cause elongation of the T1 and T2 relaxation times of the injured muscle.21 Although MRI techniques are still evolving, the images may be misinterpreted, leading to an overestimation of the actual muscle tear volume. Therefore, it is difficult to determine whether the extent of reported injuries presented in this review match with the actual lesion. By identifying determinants related to re-injury, athletes at increased risk can be identified. For these athletes, a more careful approach in their rehabilitation programme and better timing for return to sports can be recommended. Moreover, a specific rehabilitation programme can be designed when modifiable determinants of recurrent hamstring injuries are known. We could trace one modifiable determinant of re-injury, namely a specific rehabilitation programme.19 Hence, athletes with a larger volume size of initial injury as measured on MRI, a Grade 1 injury or a previous ipsilateral ACL reconstruction should be advised to take a more careful approach to their rehabilitation and return to sports. Exercises of agility and stabilisation can be added to the rehabilitation programme; also a longer rehabilitation time can be realised. Both adaptations may lead to a complete recovery of the injury and a decrease of re-injuries. Several studies reporting on determinants of hamstring re-injury were excluded based on our strict inclusion/exclusion criteria.1 4 22,–,25 In these latter studies, the initial type of hamstring injury was self-reported but not clinically classified by physical examination or additionally diagnosed on MRI/ultrasound; these studies are presented in appendix A. The results should be interpreted with caution, due to uncertainty about the presence of the initial hamstring injury. A recurrence incidence of 11.9–25% in soccer players and of 15–40.6% in Australian Rules football athletes was reported in these studies.1 4 22,–,25 A hamstring injury before the initial trauma and age were reported to be related to re-injury.4 22 23 25 If these data are added to the results of the present review, higher age would change from limited evidence for no relationship into conflicting evidence as a risk factor for re-injury. Applying our search strategy and the inclusion/exclusion criteria, only five studies were included. Because none of these studies corrected the risk estimate of the determinant for known confounders, all studies were considered to be of low quality. We used the correction of confounders as important quality criteria, because we were interested in the independent relationship between determinants and recurrent injury. Eventually, the confounders did not seem to be related to recurrent hamstring injury. Thus, it is doubtful whether it was appropriate to expect the included studies to correct for the confounders chosen in advance. However, because none of the included studies corrected for any possible confounder, the independent relationship between determinants and recurrent injury could not be proven. Thus, we still consider our included studies to be of low quality and with limited evidence as the best level of evidence. In conclusion, based on the best available evidence presented in this review, it seems that clinicians can identify those athletes at increased risk for a hamstring re-injury. Patients with a previous ACL reconstruction, a Grade 1 initial injury and a larger initial injury volume size as measured on MRI should be treated with caution with regard to both rehabilitation and return to sport. It seems that ‘agility and stabilisation’ exercises should be added to the rehabilitation programme. More high-quality prospective follow-up studies are needed, using the state-of-the-art imaging and standardised and validated clinical tests. Especially, studies with adjustment for known confounders are needed to identify the risk factors for recurrent hamstring injuries.
. Posterior thigh muscle injuries in elite track and field athletes. Am J Sports Med 2010;38:1813–9.
. 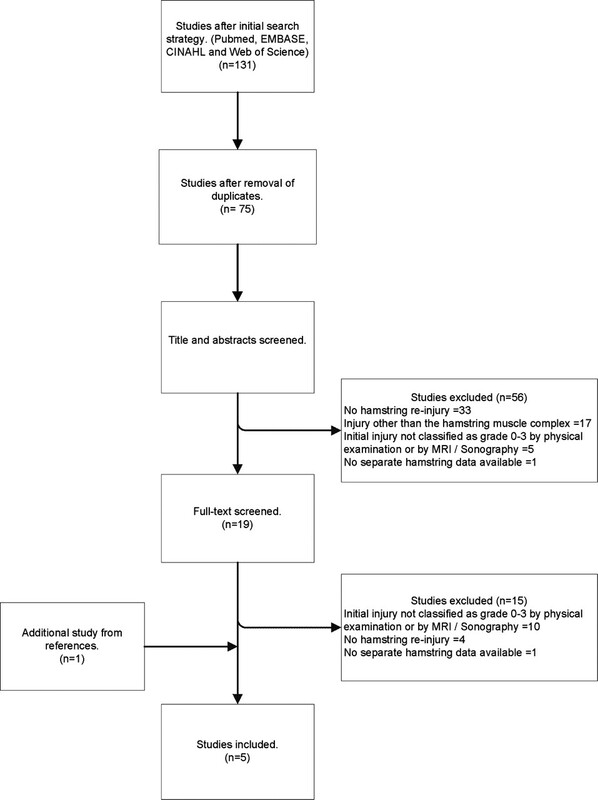 Prospective studies into the causation of hamstring injuries in sport: a systematic review. Physical Therapy in Sport 2006;7:101–9.
. Methodological index for non-randomized studies (minors): development and validation of a new instrument. ANZ J Surg 2003;73:712–6.
. Users' guides to the medical literature. IX. A method for grading health care recommendations. Evidence-Based Medicine Working Group. JAMA 1995;274:1800–4.
. Muscle injuries. In: Vanhoenacker FM, Maas M, Gielen JL, ed. Imaging Of Orthopedic Sports Injuries. Berlin: Springer 2007:22–3.
. Imaging of the hamstrings. Semin Musculoskelet Radiol 2008;12:28–41.